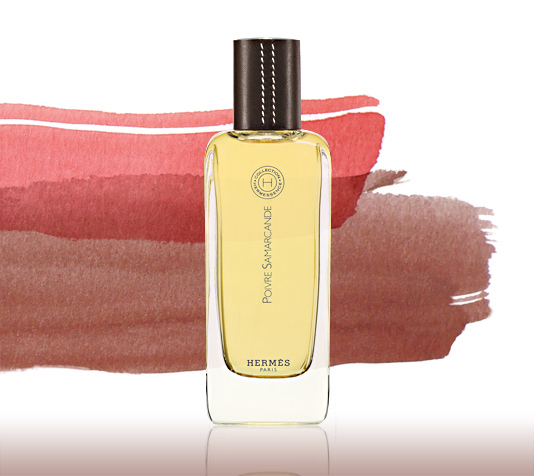 Each time that I don Hermessence Rose Ikebana I am reminded of The Different Company Rose Poivrée (2001), which in some ways is very odd because I do not like that perfume at all. Yesterday I decided to dig out my nearly full sample cube of Rose Poivrée just to refresh my memory about why I retain such a negative image of that perfume in my mind. It can all be summed up in one word: cumin. That's what I smell, whether it's in the composition or not, and it completely overpowers the rose, reminding me more of Alexander McQueen Kingdom than any rose perfume I've ever met. Until yesterday, I did not realize—or had forgotten—that Elléna also composed Rose Poivrée, but now it at least makes sense why I am reminded of it every time I don Rose Ikebana. I would describe Rose Ikebana as a refined, finished version of Rose Poivrée, with about a tenth of the spices, and more fruit added for sweetness and vibrancy. Whereas Rose Poivrée lists berries and hibiscus among its notes (although to my nose they are completely masked by the "cumin"), Rose Ikebana lists fruits, tea and citrus as notes. There is clearly an overlap of spices between these two perfumes, but Rose Ikebana is a much nicer blend to my nose, and quite enjoyable to wear. I also find this perfume to be more feminine than Rose Poivrée, and I imagine that some people who like that perfume may find this one too tame. Rose Ikebana is a spicy rose, but not overly so. It is a fruity rose, but only barely, and the sweetness is cut by the citrus. This is nothing like the candied citrus rose perfumes you may have sniffed—Rosine Un Zeste de Rose and Frédéric Malle Bigarade Concentrée (also by Elléna!) both come to mind as citrus roses with much more sugar and citrus rind than rose. Instead, this is a fresh, modern rose while still smelling sophisticated. No dowagers, but also no teenage princesses. Rose Ikebana is a unique rose perfume with just enough spice to set it apart from the crowd in terms of genre, and its excellent quality materials set it apart from many niche floral perfumes. One small caveat is in order: the citrus of this composition is bound to play out differently on different wearers' skin and could I imagine have a sour cast on some. Of course, it goes without saying that anything in this line is a try before you buy! I have finally found my dream Jardin: Hermessence Poivre Samarcande. I realize that it's not supposed to be a part of the Jardins series, but this creation captures for me what the (other) Jardins have not: a feeling of place-induced equanimity. I don't think that I'm imagining this, and I don't think that I am unduly influenced by the difference in prices, but I do think that this perfume is on a higher plane from the (other) Jardins. Best of all, I finally believe myself to have achieved an understanding of what all the Jardins devotées have been raving about. The opening of Poivre Samarcande wafts of wet sisal and is to my mind reminiscent of Yves Saint Laurent Champagne. Yes, I actually have the remnants of a bottle of the original perfume—before its name was changed to Yvresse. But Poivre Samarcande is certainly not a fruity chypre and diverges quite radically from Yvresse after the opening. How can I love a perfume devoid of so many of the things I love in perfume? That is the true magic of this composition and the proof that a great perfume is always more than the sum of its parts. It's clearly the perfectly proportioned mixture of what would normally be auxiliary or complementary notes which somehow alchemically(!) produces something truly beautiful from nearly nothing. The pepper is detectable but not dominant and certainly not heavy-handed as it so often is in compositions thrown together with less care than Elléna has evidently taken here. The caraway, paprika, oakmoss, and patchouli are woven together with the oak and the cedar into a single finely textured layer with none of those notes standing out. How can I love a such a perfume? 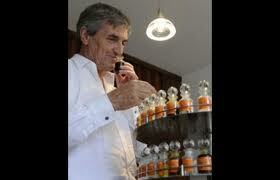 It defies explication, as does this scent. You have to wear it to believe it. There is no longevity problem here whatsoever—I am starting to wonder whether those who complain about the fleeting nature of these Hermessences may be suffering from olfactory fatigue. Or are they truly hyposmic? I'm glad you are doing this series on the Hermessences at this particular point in time. I'm in Japan at the moment, and on my way home I'll stop at the Hermes shop at Narita, and may get something (they actually are cheaper -- plus, the dollar is stronger than it's been). I had been thinking of getting a full bottle of Rose Ikebana, so am glad to hear your assessment. I do like Rose Poivree as well. I don't get all the cumin you mention. However, after your review of Paprika Brasil, I want to look further into that. I don't think I even have a sample of it back home! I don't think the Hermes SAs even offered it to me, of all of them. I'm curious of your take on the rest of them, and look forward to your posts! Konnichiwa! I'm here in Japan until the 21st. I actually have Perfume: The Alchemy of Scent on my Kindle. I've just never gotten around to reading it. I should read it in tandem with your posts while I'm here. Here I am, finally, at a computer which does not transmogrify my every word into something else entirely! You may have been wondering about this sudden spate of posts. I am cheating, in a way. Well, sort of. I wrote all of these for Il Mondo di Odore, which has been put on privacy mode by the owner, so no one can access the posts now but the authors. For that reason, I've decided to reblog all of them here at the salon de parfum, so that all of my perfume writings can be accessed by anyone out there willing to do so. I also am EXTREMELY busy, having just sent off the final manuscript for my forthcoming book (to be published in September 2015), and now preparing to embark on a whirlwind world tour to ... drum roll ... New Zealand! I'll be there for most of the year, so I let my apartment go and am moving my possessions into a storage space. I am also downsizing and donating tons of stuff, so this is a logistically complicated and exhausting process. While I finish all of this work, I simply pre-loaded all of the Il Mondo di Odore posts so that one appears each day until February. In fact, I leave on January 31, with only two large suitcases to live out of until November. I am very excited about this opportunity and it will be interesting to see whether I decide to return to Boston or not. I hope that you are having a great time in Japan. I'll be nearly due south of you in New Zealand, but apparently it's pretty far south, so it won't be an obvious excursion, although I sure would love to visit Japan again. I do intend to visit Australia, Fiji, and who knows where else in the environs--the South pole, perhaps? Once I get out of this place, I'll start posting hopefully more regularly again. The big question is: which samples and bottles to take along???? I'm actually considering traveling only with Montales and Comptoir Sud Pacifiques--because they come in those lightweight aluminum canisters!